NEW LOWER PRICE! Impressive custom-built home on large wooded private backyard with mature landscaping and expanded deck. 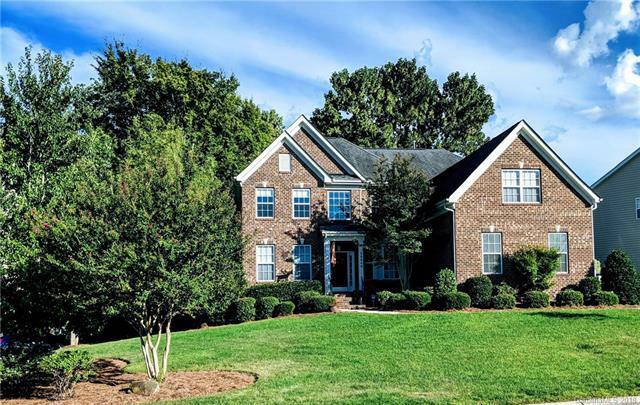 Located in the golf course community of Olde Sycamore, & fantastic Union County Schools. The open concept first floor unites the living, dining and kitchen spaces and includes in-ceiling speakers. The chefs kitchen, upgraded in 2017, features new quartz counter tops, huge waterfall island, marble backsplash & custom hardware. Professional grade Monogram appliances include a 36 gas range with stainless griddle, 48 built-in refrigerator & wine chiller. The stunning upstairs Master Suite has extensive closets. Also upstairs are 3 other bedrooms, one of which has a private bath. The rec room has large windows overlooking the backyard. This house is in move-in ready with custom plumbing and lighting fixtures, fresh paint throughout and newer AC units! The auto-enthusiast 3-bay garage, high-lift doors and custom flooring. The community features a pool and clubhouse.